If you are considering adding an industrial tool vending system to your business in Kansas City, Wichita, Dallas, Fort Worth, or any other city in the Midwest, then the ideal place to turn is Wm. F. Hurst Co., LLC. We offer state-of-the-art tool cribs from industry leader CribMaster, and our associates have years of experience working with these specific impressive inventory management systems. So, you can feel confident that you will receive an outstanding product as well as valuable customer support. 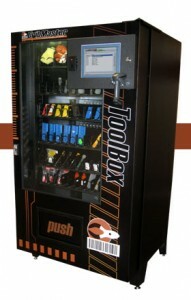 A CribMaster industrial tool vending system can help you manage your tooling inventory in an organized and efficient manner while eliminating many common problems associated with industrial tools, including employee hoarding and theft. These systems utilize innovative RFID tracking technology and advanced software, and the system can provide you with a variety of information, including who checked out a specific tool, how long the tool was in use, and when or if that tool was returned to the crib. Having this information will enable you to more effectively manage your tooling inventory, which can allow you to reduce operating costs. To learn more about the industrial tool vending systems we have available as well as our other outstanding CribMaster inventory control system products, contact Wm. F. Hurst today. We proudly serve businesses in cities throughout the Midwest, including Kansas City and Wichita, KS, and Dallas and Fort Worth, TX.